Schools Director Dr. Shawn Joseph began cleaning out his office over the weekend, as the Metro School Board prepares for a vote Tuesday on the possible termination of his contract. NASHVILLE, Tenn. (WTVF) — Schools Director Dr. Shawn Joseph began cleaning out his office over the weekend, as the Metro School Board prepares for a vote Tuesday on the possible termination of his contract, NewsChannel 5 has learned. 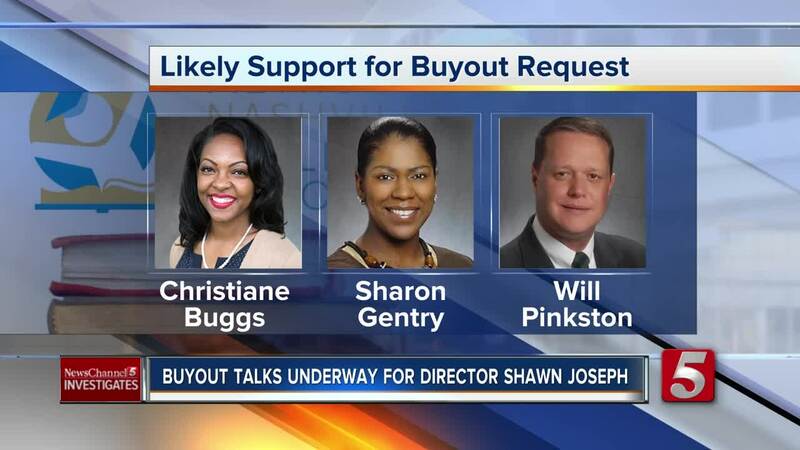 Meanwhile, board chair Sharon Gentry has been negotiating a potential buyout of the last 15 months of his four-year deal. A NewsChannel 5 analysis suggests the cost to taxpayers could total about $400,000. "I have been in communication with Dr. Joseph’s attorney and the board chair regarding a possible buyout," Metro Legal Director Jon Cooper confirmed to NewsChannel 5 Investigates. "The next step would be, if the chair comes up with a proposal she wants to present to the board, she would present that in the form of a term sheet. It’s basically the agreement in principle, the basic provisions of an agreement, subject to further negotiations." MNPS spokesperson Dawn Rutledge said, "Dr. Shawn Joseph is still the director of schools. He has cleaned a few things from his office. He is currently out of the office." Right now, it appears that there are only four solid votes on the nine-member board to terminate Joseph's contract. Anna Shepherd recently called for the vote, joining Fran Bush, Amy Frogge and Jill Speering in saying it's time for new leadership. Following Shepherd's move, new board members Gini Pupo-Walker and Rachael Anne Elrod released a joint statement that called for "revisiting the terms of his contract and finding another path forward that is mutually agreed upon by all parties." Joseph himself signaled that it was time for him to part ways with the district. The embattled schools director, who was signed to a four-year contract that began in July 2016, has faced a number of controversies in recent months, including a sexual harassment scandal, questions about no-bid contracts and a morale crisis that's now gripping the district. A majority of school board members recently gave him negative evaluations on his job performance.